The Crossings at Fourth and Preston is the first supportive housing development in Virginia with both mixed incomes and EarthCraft certification. Half of its units are set aside for those making less than 50% of the Area Median Income (which would be $38,350 for the Charlottesville area) with the remaining 50% for individuals who were formerly homeless. Each unit at The Crossings at Fourth and Preston comes fully furnished and is approximately 350 square feet. Each also has a full bath and a kitchenette with an Energy Star rated range and refrigerator. The complex has access to public transportation, a security system, community room with a kitchen and outdoor patio, fitness room, computer room and available office space to allow on-site management 16-hours a day. Strong local government support was invaluable to the success of the development. Former Charlottesville Mayor and current City Council member Dave Norris had long championed affordable housing in his city. A couple of years ago, he stood at the corner of Fourth and Preston St. in front of a small crowd and stated that the vacant office/retail building in the background was going to be the site of a major step forward to end homelessness in Charlottesville. The City of Charlottesville loaned the developer $1,550,000 to purchase the property and, along with Albemarle County, supplied the funding for rent subsidies. 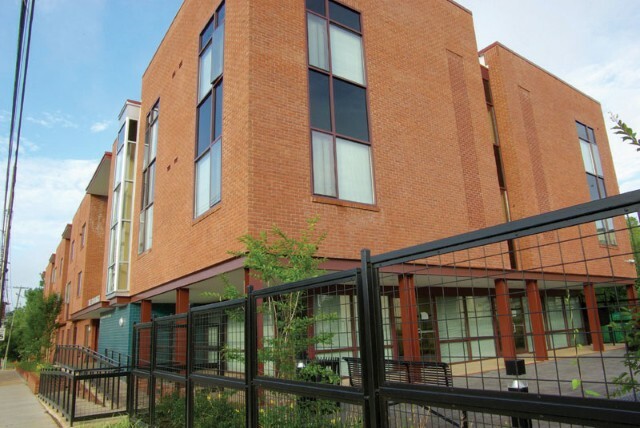 In March 2012, Dave’s declaration became a reality with Virginia Supportive Housing’s (VSH) transformation of the once environmentally-contaminated property into 60 units of permanent supportive housing. Project financing came in the form of Low-Income Housing Tax Credits (LIHTC) through VHDA, which raised just over $4 million of the total $6.7 million development costs. In addition, VHDA provided a below market rate permanent SPARC multifamily loan of $900,000. Other funding sources included DHCD HOME funds and local foundation grants. So let’s recap: an environmentally-contaminated former shopping center, with the assistance of regional cooperation, becomes an attractive, energy-efficient asset to the neighborhood, providing permanent supportive housing for the homeless in a mixed-income setting. And the development also wins the “Best Affordable Housing Energy Conservation Effort” at the 2012 Governor’s Housing Conference. It sounds like our definition of “affordable housing nirvana” needs updating!